These slow speed vertical, 4 stroke diesels are rated for continuos running. These engines have run on all kinds of diesel, bio diesel, and vegetable diesel of 18,000 BTHU / lb. All castings and pistons are made of a close grain cast Iron. We fit ours with tapered roller bearing mains these also use the Bosch micro fuel injection. They are solid, rugged time tested engines, that seem to run and run.These engines are built with care and pride by the workers at BASANT AGRA. They are built to last. Direct injection in open type combustion chamber provided in an aluminium alloy piston with long stem multihole nozzle resultsinto low fuel consumption and easy starting. 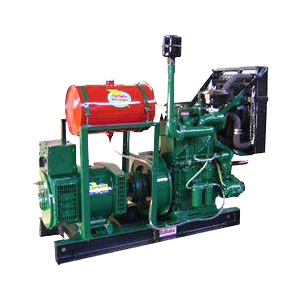 High Speed diesel is supplied to the fuel pump by gravity feed through an efficient replacable paper element type main filter. Industrial type double bowl heavy duty type filter BOSH make also available. Engine’s moving parts are lubricated by force feed and partly by splash lubrication. A throwaway type bypass filter is provided for filtering the lubricating oil. Lub. Oil is supplied under constant pressure by lub. Oil pump.Centrifigal type Lub. Oil cleaner also available for long engine life. Engine is continuously cooled by flow of water. 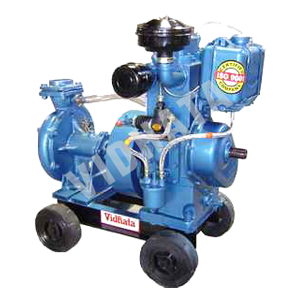 Either by Radiator mounted on engine or direct water supply. Front radiator mounted engines also available. DRIVEStandard rotation is clockwise looking at fly wheel. 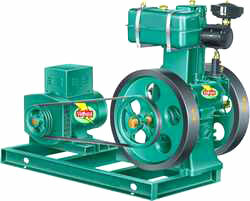 Engine with reverse rotation can also be provided on demand. The engine is designed for starting by hand. 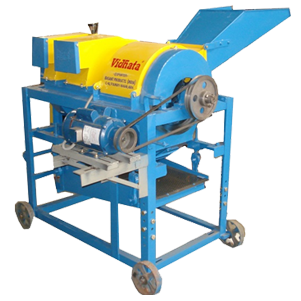 Electric Start Provision can also be provided against specific requirement. Dynamo battery chargers also available. Standard power take off is from flywheel side. 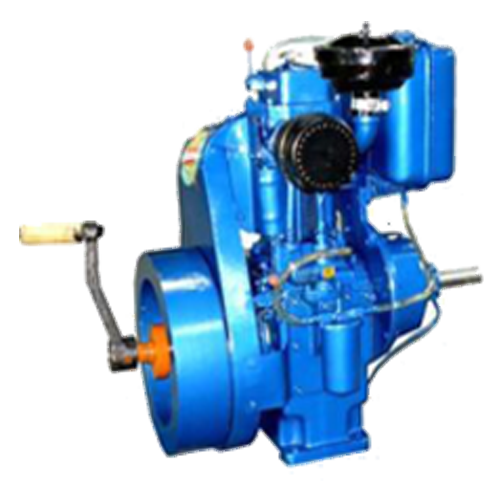 Power Take off from gear end at half speed can be provided on demand. All above engines are handle start. STANDARD PARTS SUPPLIED WITH ENGINE (FREE OF COST) Air Cleaner, Silencer, Wrench Set, Screw Driver, Starting Handle, One Bag, Oil Can , Instruction Manual. Wooden Case sea worthy Packing Included. 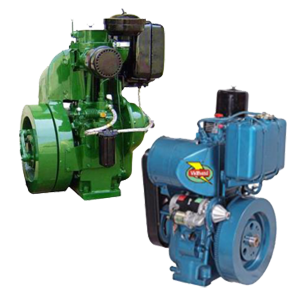 These are Multipurpose Engines can be used in Irrigation , Threshers, Flour Mills , Generating , Turbine Pumps , Saw Mill , Constructive Work , Industries , Powering Crushers, use, concrete mixtures Etc. 12 Volt electric start device, with dynamo battery charger. Engine safety features high temp, LOP auto cut . Glow plug for cold starting . Radiator mounted on engine . Original CS type model also available with inspection jackets. 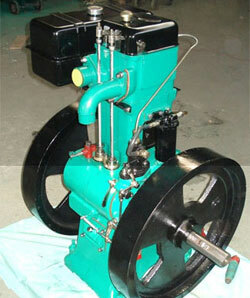 Complete Diesel engine & alternator mounted on common base frame. 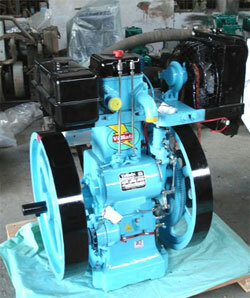 Vidhata Lister type Slow speed engines are running successfully in USA, Canada, French polynasia, UK and Australia, Our company can supply superb quality of Lister Type diesel engines, which are well finished quality and all casting sand is removed with high pressure and eproxy painted finish interiour and exteriour. 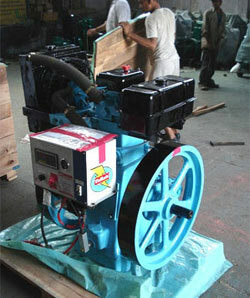 Complete engine is packed by streched film and outer case of wood or iron frame. Our Quality spare parts such balance weight, En 9 crank shaft, steel gear, online lub filter Gunmetal Rocker lever and Lub oil pumps make engine enough strong and tough to make it run 24/7 and our engine also make you remember the old CS RA lister design fly wheel, Water jacket, 7 stud head gaskit original bore of 114.3 mm all finished well and assembled before testing of each spare parts. For making an order you have to request us for performa invoice and we will send you Proforma invoice with payment details bank swift code and amount to be transfred. 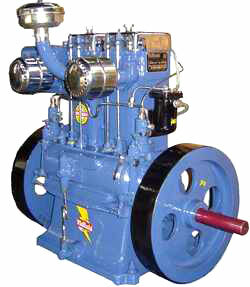 The slow speed (6hp -650 rpm and 8 hp-850 rpm) engines were first brought to India by the British during their rule . They were first introduced in India somewhere around 1920’s. 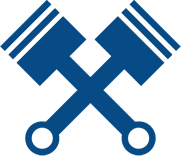 They were basically used as prime movers mainly to pump water, though they had various other applications too. The LISTER ENGINES very popular because of their simple design and ability to perform non-stop for a very long period. However the British rule did not last long after this, and were thrown out of India in 1947. The new Indian Government and the free public was in no mood for any British company or its product and most of the merchandise from Britain was banned. However the need for this engine was so great that people started bringing in parts to replace the old worn out ones to keep the engines running. The western Indian coast being closer to Britain was preferred for imports and as a result all the repair shops or maintenance place for such engines started cropping up around Gujarat (a western state). Some enterprising people went ahead and tried to assemble the engines from the parts and soon realized they could do it without much difficulty. They also realized they were paying too much in cost, freight and customs duty (still very high for British goods) especially on casting parts such as flywheels which were just simple castings and did not require any precision job to make them. 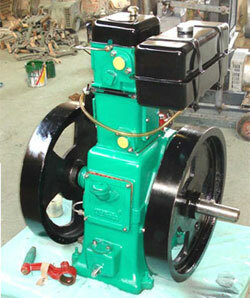 So the first flywheel was cast in India around 1950, followed by other casting parts like the body, block and head. The first “open forged ” crankshaft was manufactured around 1955 and by the year 1962 the whole engine was indigenous and being sold all over India in many local brands , however the “Lister ” name stuck to the engines and any engine with two flywheels is still known as “Lister-type” in India. With growing economy and increasing needs and applications, people felt the need for more power, so the 10 hp came into being around 1980 and soon the 12hp double cylinder was in place by 1990 and than 16hp – double cyl followed by a 20hp-double cylinder. The research on these types of engines still continues and therefore we now have a “LITTLE GIANT ” and other variations.The British continued to produce the Lister CS 8/1 and 16/2 thru 1967. Some suggest that the interruption AND SLOWING DOWN of the trade between INDIA and Britain which saw the demand and profitability fall , was the cause of shuting down the production line for these engines. Production of the British 6/1 and 12/2 engines stopped in 1974 / 1975. 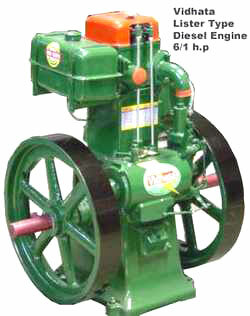 This left India as the sole producers of “Lister” Type engines. Today , it is far easier to get parts from India then anywhere else. Since Indian companies had to be backwards compatible with the British built Lister they have continued to offer highly faithful copies of this design, and there is a good degree of interchange possible.